At the beginning of our time, three brothers, Gods among men, started the world with two planes...one of the living, and one of the underworld for those who did not pass on, or owed a life's debt. There was a war that broke out between the brothers, Osiris god of the Underworld, started out of jealousy and greed, wanting more than the Underworld for himself. It sparked a timeline of tragic events to the point the youngest brother, Horus, was killed by Osiris. 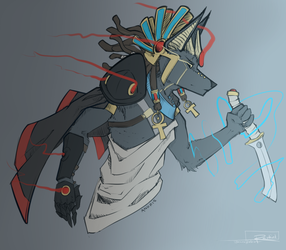 Anubis had stepped in, and his heart grew cold and dark at the death of his younger sibling. In a horrible clash of battles in an ever-lasting war, the daughter of Anubis, Setko, decided she no longer wanted to take part as his General. But leaving would be fatal, as it was against Anubis' will. 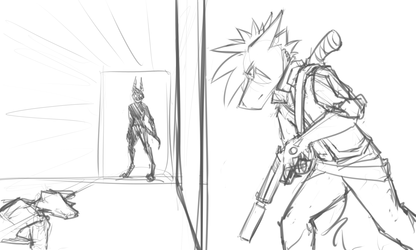 In a desperate angry attempt, Anubis set out his Undead hell hounds after her to kill her, but he didn't expect Lana, the Mother of Canines, to step in as her guardian.